First RT: Brill 39-E trucks ON 18199 22 Feb. 12 promised 27 Mar. 12 — 28 trucks for 14 cars. P car 457 with 39-E S p. 145. Poss. only the 39-Es were repl. and others retained 27-GE-1s. Another truck order — Brill ON 21842½ 12 76-E-2 trucks with GE 263 mot. of 2 July 23, poss. for semis. NOPSI usually divided orders between GE & Whse. Many 76-E-2 trucks ordered by NOPSI in early-mid 1920s — all semis poss. RT with these. 76-E-2s ordered for some Palace cars at the time, difficult to determine which truck orders went to which cars. Also, four Brill 39-E trucks ON 22027 28 Apr. 24 from June 23 — cars unspecified, poss. repl. trucks for 2 cars (semis?). All semis scrapped (except 453) in 1935. 453 kept at Canal Station until ca. 1940 (P - N) when moved to Napoleon Yard (Napoleon & Tchoupitoulas). There the 453 was used as a training car. At first the car could operate on trackage there, but by 1948, maybe later, 453 was moved into the station building (an old power station blt. ca. 1892 by NO&CRRCo), where it was prepared for stationary use as training car, more as trouble-shooter training. The car's motors could run, however, for the powered axles were blocked up to clear floor (P - S p. 146). Car 311, one of an order of twenty-five (300-324, later 450-474 per NOR&L's 1918 renumbering program) built and delivered 1906 by Brill's American Car Co. subsidiary. It's a fine example of Brill's semi-convertible patented car design. These exterior and interior views appeared in the Brill Magazine of August 15, 1909 (the delay in publication is inexplicable). Car builders' photos advertised their cars' features. Semi-convertibility allows both upper and lower sashes of the car body to disappear into the space between carlines and roof. Each platform had two two-panel doors and two gates. The car body had bulkheads and sliding doors. (Note the fixed Brill steps, which surely were difficult for children and ladies wearing long skirts and laced high-heel shoes!) The cars were double-ended, delivered with Brill 27G-E-1 trucks. American had “semis” ready to ship; New Orleans' order was dated May and the first cars were rolling on the Coliseum line the next month! The door and gate as shown here may not have been an NOR&L practice. To open and secure the rear gate at every stop required the conductor to leave his station at the sliding doors where the handle to open and close the platform doors, and the leather straps to register fares and ring the motorman's signal bell, were located. This set-up provided fast fare collecting, saving time and making it easier to keep on schedule. Unfortunately, research has yet to discover any official instructions for using the gates. To increase ventilation, it's possible the doors on the left side could have been secured in the open position, with the gates set for safety. Thus, with all windows open, even those in the clerestory, the full effect of the semi-convertible features would be in action. The interior features: A lighted sign in the monitor's glass end window, clear to see — etched glass, an elegant touch! Also in the Victorian and Edwardian “parlour” concept are the bulkhead's sliding doors, fine mahogany paneling, polished brass fittings, and the “cash” and “other” fare registers. Rods that worked these registers run along and just below the clerestory windows, and the rattan seats were comfortable. 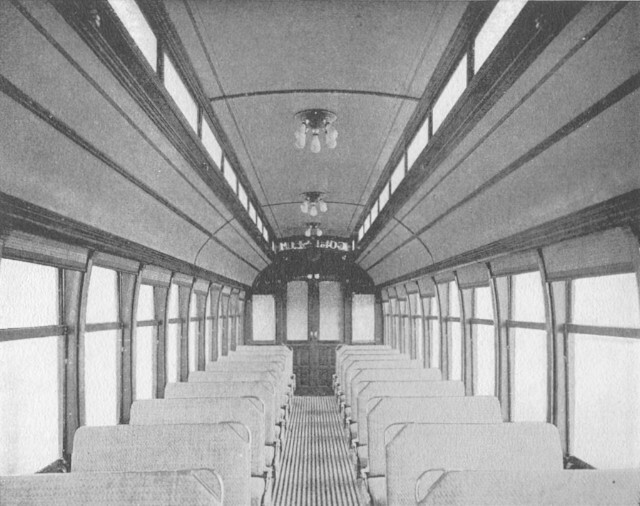 On the next page is an interior view of 453 with changes NOR&L made in the mid to late teens: wood slat seats, sliding doors removed, bulkheads reduced with enough remaining to strengthen the point where umbrella hoods join roofs, and the most noticeable — semi-convertibility cancelled, upper sash fixed, lower sash rising part way. The rich elegance has, lamentably, given way to functionalism. This extends to the exterior, where “fishbelly” sides replaced waist and rocker panels. Platforms now have folding steps and four-panel platform doors. Note the heavier 76-E-1 Brill trucks substituted for the original 27G-E-1s. Text copyright © 2008 Louis C. Hennick. Picture captions copyright © 2012 Louis C. Hennick and H. George Friedman, Jr. All rights reserved.